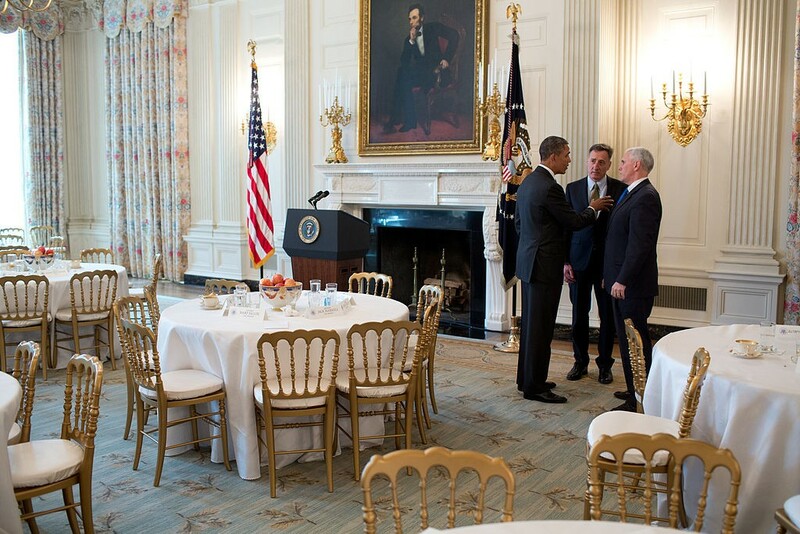 United States President Barack Obama talks with Governor Peter Shumlin of Vermont, centre, chair of the Democratic Governors Association, and Governor Mike Pence of Indiana, after a meeting with the National Governors Association in the State Dining Room of the White House on 25 February 2013. Late last December, Senate Democrats gathered at Montpelier's Capitol Plaza Hotel to discuss priorities for the upcoming legislative session. Sen. Peter Galbraith (D-Windham) made a brief pitch for raising the state's minimum wage from $8.73 to $12. What did Gov. Peter Shumlin think of that, the group inquired, when he stopped by to talk about his priorities? "I'm willing to enter into any conversation about ways to ensure we have an equitable minimum wage," he told the senators. Then came the predictable: "Obviously with everything we do, the devil is always in the details." Roughly two months later, Shumlin appeared to have exorcised whatever devilish doubts he might have harbored. Last Wednesday, he stood next to President Obama on a stage in Connecticut, grinning and clapping heartily as the president and several other New England governors called for a regional push to increase the minimum wage to $10.10. Shumlin's endorsement of the wage hike — followed by his declaration that Vermont would go it alone even if other states back down — blindsided many back home. Statehouse advocates, opponents and lawmakers have been preoccupied by a different discussion: whether employers should be required to offer paid sick days to their workers. "The governor hasn't expressed that desire to me," said Sen. Kevin Mullin (R-Rutland), referring to the minimum wage proposal. Mullin chairs the economic development committee, which has jurisdiction over both issues in the Senate. "We knew it was out there, but the focus and attention and debate and vote counting by leadership has all been on paid sick leave up to this point," said Jim Harrison, president of the Vermont Grocers' Association, a group that opposes both pieces of legislation. The battle over the paid sick days bill had been brewing for some time. A coalition of 13 advocacy groups and unions, including the Vermont NEA, the Vermont Workers' Center and Voices for Vermont's Children, redoubled its efforts over the summer and reinvigorated the long-lingering campaign. Business groups such as the Grocers' Association and the Vermont Chamber of Commerce have been fighting back, but Harrison didn't hold out much hope. The House bill had a healthy 34 sponsors, and an early head count conducted by supporters indicated it had majority support. In early February, it passed the House Committee on General, Housing and Military Affairs by a 6-1 vote and moved on to the House Committee on Appropriations. If the bill passed in the House, Senate President Pro Tem John Campbell promised to bring it up for a vote in the Senate. Shumlin, however, hasn't come out for or against paid sick leave. Sounding very much like he did at the Capitol Plaza, he issued a written statement in January saying: "We all believe this is the right thing to do. The devil is always in the details, including who pays and how it is mandated." On Friday, his press secretary, Sue Allen, confirmed the governor's views hadn't changed. Harrison had been less concerned about efforts to raise the minimum wage. Sure, three bills had been introduced, but none had budged, and there had been next to no discussion of them in committee. Although Shumlin indicated in mid-January that he would support an unspecified increase in the minimum wage, he didn't appear to be pushing for it. There was no hyper-organized grassroots effort, and no legislative leaders were publicly talking about it. That changed on February 26. With just a week and a half of legislative business remaining until crossover — the deadline for bills to get voted out of committee — Shumlin and House Speaker Shap Smith told the Burlington Free Press they wanted to pass a minimum wage hike this year. The next day, the duo told a gathering of grocers and retailers not to sweat the paid sick days bill. But as for the minimum wage bill? Surprise! It's got legs, and they're moving fast. What hastened this legislative leapfrogging? "When the president made his call for raising the minimum wage a national priority, that's when I think some life was breathed back in the Senate and House bills," said Sen. Tim Ashe (D/P- Chittenden), a cosponsor of one of those bills. Regardless of who approached whom, several lawmakers say they weren't surprised to see Shumlin embrace the idea. How would it look, after all, if the governor of one of the bluest states, who also happens to lead the Democratic Governors Association, abstained from an initiative being pursued in part to help usher Democrats into office during the midterm elections? Should DGA agendas and White House pull-asides dictate policy in Vermont? "When it's the right policy, I think it's advantageous," Galbraith said, adding that he has yet to see it happen with the "wrong policy." And should a last-minute move inspired by national politics overtake a long-running effort to provide paid sick leave to Vermont workers? At a Montpelier press conference on Monday, Shumlin denied a relationship between the two bills, but it seems likely that neither the governor nor legislative leaders have the stomach to pass both in a single session. Smith said there's concern about imposing more mandates onto small businesses after their traumatic experience of the state's health care exchange, but that concern, he said, doesn't pertain to a minimum wage increase. Harrison plans to argue otherwise, but, he said, "I'm also a realist, and if the governor and House and Senate leadership have given their blessing, we can kick and scream all we want but they can do what they want." Shumlin's outlook on Monday was similar: "I'm confident if the legislative leadership wants to get a minimum wage bill done, which they do, we'll get it done." But Shumlin's plan doesn't totally jibe with the bills that have been introduced back home. It's much more modest. The governor wants to implement it over three years and would suspend automatic inflation-linked wage increases during that period. Whether lawmakers will fight for a bolder increase or go gently with Shumlin is unclear. Or, as Galbraith puts it: "The question is whether, in the usual manner, we will do the governor's bidding and retreat." For the second year in a row, the question of who should hold the gavel at city hall could split the Burlington City Council clean down the middle. This time, a gentlemen's agreement could work to the minority's advantage. The Democrats struck a deal last year to resolve a prolonged stalemate between the two candidates for council president — Joan Shannon (Ward 5), a Democrat, and Karen Paul (Ward 6), then an independent, who was initially backed by all the non-Democrat councilors. The council agreed to elect Shannon on the condition that if the same scenario were to arise in 2014 — a 7-7 tie vote between a D and a non-D — the council would elect the latter. Democrats enjoyed a solid majority at the time, and the motley alliance of Progressives, independents and a Republican that ganged up against them was already beginning to fray by the time the deal was struck. But that opposition looks different after the latest round of city council elections. Some new faces emerged in last week's Town Meeting Day election, but the results didn't dramatically change the political composition of Burlington's governing body. After a two-year hiatus, Republican Kurt Wright coasted back into office in Ward 4, taking a New North End seat previously held by a Democrat. The Progressives picked up a seat in Ward 1 with the election of Selene Colburn. And Democrats maintained their ranks with a reshuffle: Bianka Legrand beat out her Republican opponent, Tom Treat, in Ward 7, and longtime independent Councilor Paul shed her I for a D. The net result, once again, is half Democrat, half non-Democrat. Members of the minority parties say it's nothing personal — they've got no major complaints about Shannon's tenure — but they aren't about to pass up a chance at the presidency. As the keeper of the council's agenda, the president holds some serious sway. A non-D in the center seat would almost certainly make the sailing rougher for Mayor Miro Weinberger. There are plenty of possible candidates. Progressive Jane Knodell (Ward 2), who presided over the council from 1999 to 2001, is mulling a run, but she said she isn't the only one thinking it over. Two other ex-presidents are still around — Wright, who said he isn't coveting the post but hasn't ruled out the possibility, and independent Sharon Bushor (Ward 1), who couldn't be reached for comment. Don't expect the Democrats to cede the presidency without a fight. Shannon said she's considering running again, but she knows she needs eight votes to hold onto the post. Asked whether she was a contender, Paul said she'd support whomever the Democrats choose. At least three of her colleagues — none of whom wanted to be named — suggest she joined the party simply for the political capital that comes with the Democratic label. They describe Paul's stance as hypocritical, given that a year ago she wrote in an email to fellow councilors that they should support her over Shannon because she "intimately understands what it means to be nonpartisan." In response, Paul says, "I don't think they can appreciate in the same way I can being an independent and not caucusing with anyone. I don't think they can fully appreciate how much more challenging it is." Paul described her decision to turn Dem as a "natural progression." She started caucusing with the party a year ago, because she said the access it affords makes her a more effective councilor. Paul cited "being able to have the opportunity to have an open exchange with colleagues about agenda items as well as the fact that the mayor attends these caucuses." Regardless of who takes the helm, Knodell predicts pushback against the administration — though not necessarily along party lines — on certain aspects of Burlington's emerging urban plan, including closer scrutiny of the affordability of proposed downtown housing developments. Paul Heintz was out last week. His column will return next week.